When it opens on July 1, 2017, the Canadian History Hall will feature about 1,800 artifacts that illuminate the history of Canada and its people from earliest times to the present day. 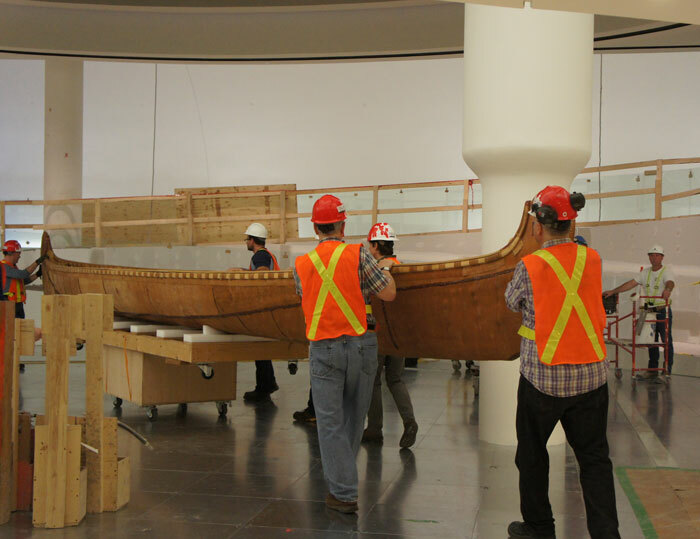 All of these will be authentic historical objects with very few exceptions, the most notable of which will be a full-scale reproduction of a 10-metre canot du maître, or Montréal canoe. In the late 1700s and early 1800s, Montréal-based fur interests — particularly the North West Company — used such birchbark canoes to transport trade goods from Montréal to Fort William at the head of Lake Superior, and to transport furs back from that location to Montréal. The canot du maître was ideally suited to this back-and-forth journeying: it was strong enough to carry a tremendous weight (4 tons of cargo and 12 voyageurs), light enough to portage around rapids and between waterways, and simple enough in construction that it could be repaired with materials found on the shores of the St. Lawrence River and the Great Lakes (birchbark to mend breaks, spruce root to sew pieces of bark together and spruce or pine gum to waterproof seams). Sadly, few if any canots du maître have survived into the 21st century in a condition that would allow us to exhibit them, hence the need to have this one built to be displayed in the section of the Hall that tells the fur trade story. 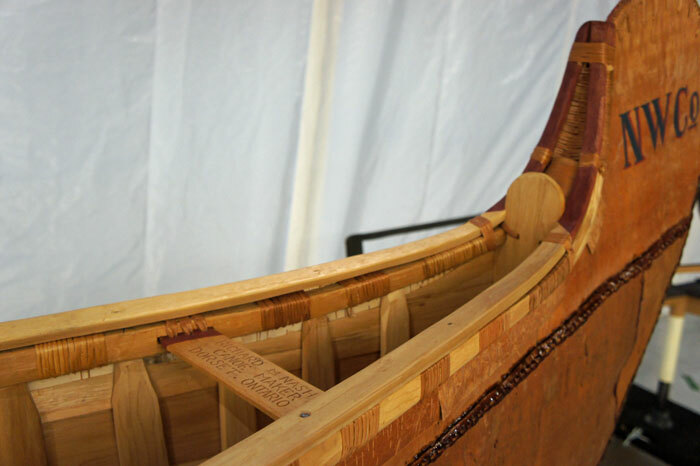 The canoe is the modern handiwork of master canoe builder Richard (Rick) M. Nash of Dorset, Ontario. For over four decades, Nash has studied and documented Indigenous and fur trade canoe-building techniques. He has acquired extensive hands-on experience in applying these techniques, having built dozens of canoes using traditional materials, tools and methods. He made this particular canot du maître over four seasons in 2013. In winter and early spring, he set out on snowshoes to harvest sheets of birchbark and solid pieces of cedar and spruce. In summer and autumn, he built the frame with simple hand tools (an axe, a crooked knife and an awl), sewed on bark panels, lashed on gunwales with spruce root and sealed the craft with pitch. 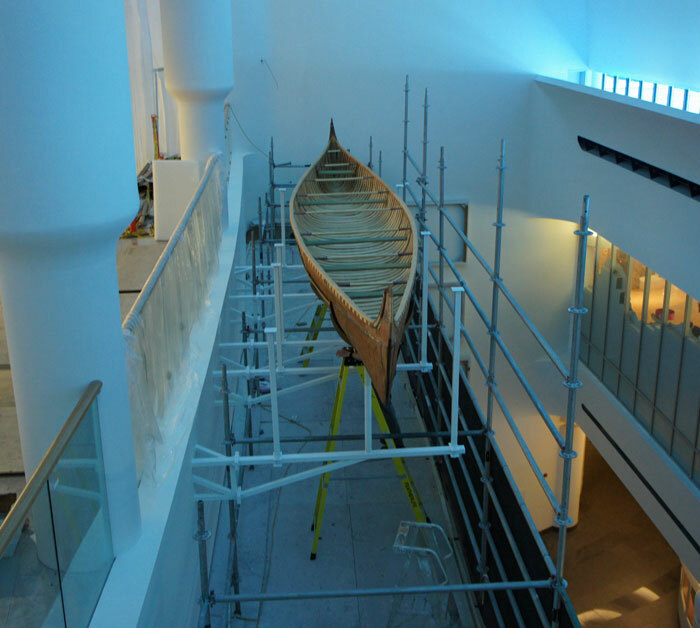 Nash’s canoe — like its precursors built in the workshops of late 18th century Montréal — reflects a convergence of Indigenous and Euro-Canadian experiences. To meet the transport needs of Euro-Canadian traders, the first builders of canots du maître adopted and adapted techniques perfected over centuries by Indigenous Peoples. Their canoes conveyed mixed crews of French-Canadian and Haudenosaunee voyageurs back and forth between an enclave of European settlement (Montréal) and Anishinaabe homelands in the distant West. Thus, the canot du maître exemplifies a theme that will run throughout the entire Canadian History Hall: encounter and exchange between Indigenous Peoples and newcomers.